Do you ever think about the metaphysical aspects of gemstones when you're making things from them? 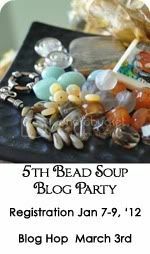 I'm very interested in this and have learned in a lot in my short time beading & stringing. Whether you believe it or not, it doesn't hurt to consider this when you're making something specific for any other person. My almost-daughter (a friend of our daughters) has been trying to get pregnant. At 38-39-40, this is not easy. I made a bracelet w/ stones that are said to enhance fertility. 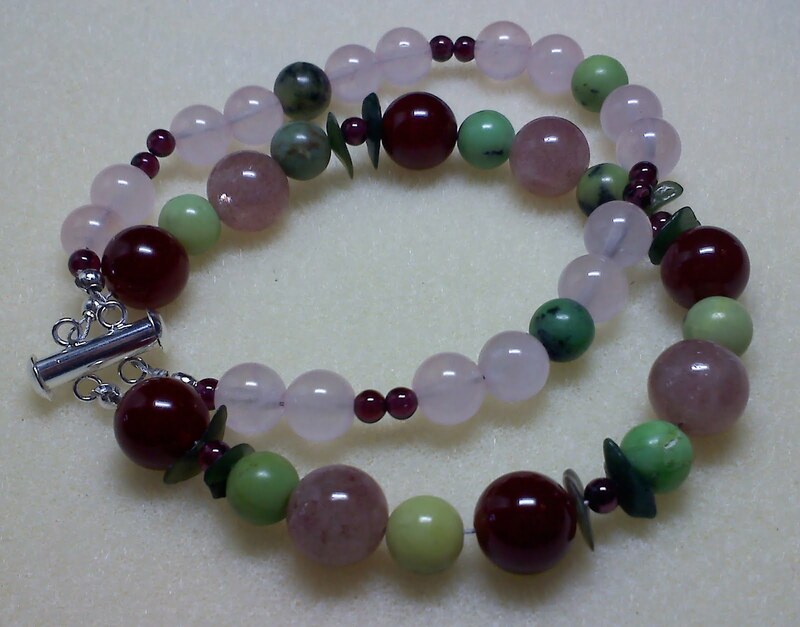 The stones included chrysoprase, green jade, carnelian, quartz and garnet. Our dear almost-daughter isn't pregnant yet but we're still hopeful. One time a dear friend was going through a very, very stressful time in her life. So I ma de a bracelet that used stones said to promote balance, harmony & peacefulness, to calm conflict and agression, and to increase desires for new experience and provide general protection. 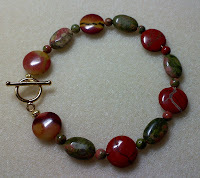 Those stones were unakite, red jasper and mookaite. 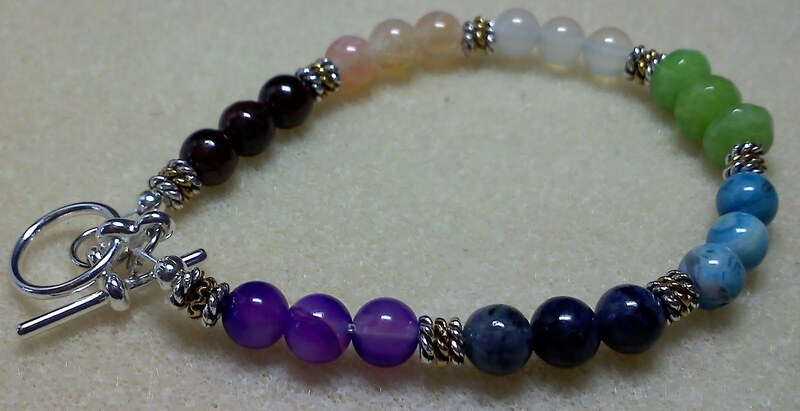 And for good measure, I made a few bracelets that covered the chakras, those wheels of energy along the body. 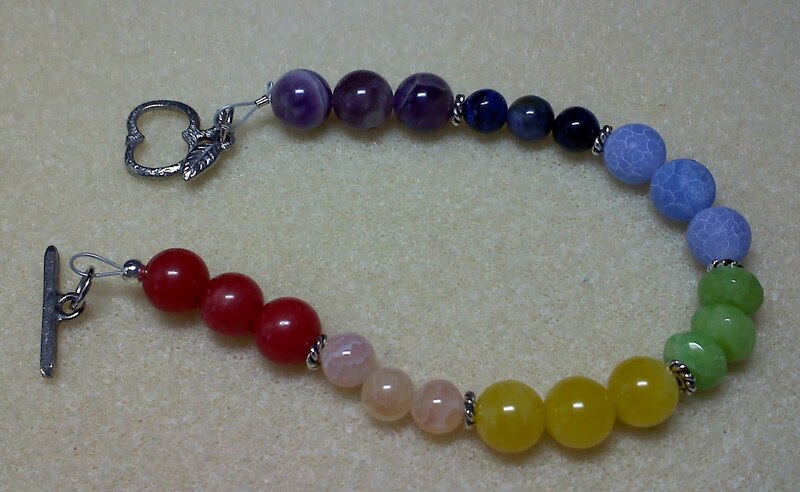 I made some with glass in the colors of the chakras but then decided gemstones would be more powerful. So I used garnet (or red jade), dragon vein agate, crystal quartz (or yellow jade), peridot, crazy lace agate (or fire vein agate), sodalite, and amethyst in those. Here's a picture of each of them. I'd really be interested in what you think about all of this. My interest in metaphysics goes back way before I started to make jewelry but I love the that it ties in so naturally here. Please let me know what you think. Thanks! I think they are fabulous, well done! I like the metaphysics side too, it makes the piece of jewellery more meaningful to the wearer if you have thought about what the gemstones signify. I love this! I've done the same thing when making jewelry. I have a friend who is a medium and I'm going to make her a pendant with Hematite to ward off negative energy. What else should I add to it?? Protection against evil and all that, lol. very interesting post! i work mostly with glass, but i figure any extra boost from the beads can't hurt. love your designs! (and look! i'm commenting! Oh I need one of those balance ones!!!! I have so off balance on a regular basis. I am so glad you know this information because I am sometimes in need of special stones. Sally, how thoughtful of you to consider the metaphysical traits of the stones you include in your designs! I know you almost-daughter must truly appreciate the thought you've given to the special bracelet you made for her. I'm hoping she'll have good news soon! !